How can you help be "green"
We don’t’ get a ton of requests for “green” (not the color by the way) weddings. It’s not always the first thing that brides think about. My guess is that the word “green” makes them think, “I probably won’t get all the beautiful flowers if I choose to have a “green” wedding.” Definitely, not the case! In Los Angeles, we have so many options when it comes to flower choices. Flowers are flown in from many different parts of the world but many are grown right here in our own backyard! Guess what; buying from local growers IS being “green”. Not only are you supporting your local community but you are buying flowers locally grown which saves on fuel emissions from shipping. Some of the prettiest flowers I pick up from the LA flower market are from local growers. One of my favorite providers is Endow Nursery. Greg is the owner and he has the most amazing ranunculus, anemones, garden callas, lisianthus, sunflowers, iris, sweet peas and Dahlias. Imagine stuff cut on Tuesday and purchased by the consumer on Wednesday!! What a turnaround! It doesn’t get any fresher or GREENER than that! One of my favorites parts of floral designing is sending out an arrangement for a birthday, anniversary, get well or just because. I love when the recipient receives the arrangement and they are so genuinely excited. How could you not be happy...you just received flowers! When clients order the arrangement we frequently try to convince them to spend a little more money on the container that the arrangement is designed in. The vessel carries just as much weight as the flowers themselves. Not only is the container a great keepsake after the flowers have died but it adds to the beauty of the floral arrangement. Imagine a basic glass square with roses, hydrangea and tulips. Pretty visual....BUT imagine that same arrangement in a great antiqued ceramic vase! Even more beautiful! We just put up our new spring window display at The Hidden Garden. So cute! i love it! On the outside of the window we had vinyl lettering to help make the window pop! 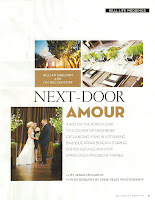 We recently had the pleasure of attending a dinner at Casa Del Mar & Shutters on the Beach in Santa Monica. 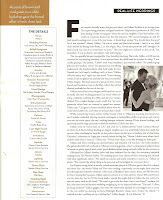 The Hotels hosted an amazing event for the wedding planners that they frequently work with. A cocktail reception was at Casa Del Mar and the dinner reception was at Shutters on the Beach. The Hidden Garden was asked to create and elegant "mock" ceremony for their ballroom so the planners could visualize where the ceremonies usually take place. We choose to design a very clean a sophisticated ceremony. An illuminated Chuppa Structure (lighting my Images) adorned with two bouquets of yellow roses and yellow cymbidium orchids. The aisle was lined with lemon leaf, yellow rose petals and illuminated candles. 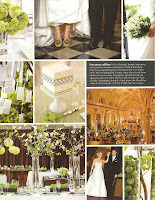 The Entrance to the aisle was flanked by two silk dupioni pedestals with amazing yellow bouquets. 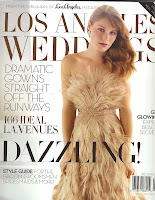 Check out our new featured Wedding in Los Angeles Wedding Magazine. with the place cards displayed atop flower filled boxes. filled with monochromatic eggplant flowers, including: dahlias, cala lilies, orchids, etc. 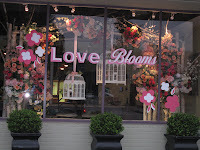 Twas the night before Valentines Day and all through the store, the flowers were ready to be delivered to your door. The roses were blooming the tulips were bright, everything was ready and perfectly right. Many hours were spent preparing for this day...for that perfect arrangement sent to be sent your way. The cooler is filled with a sight to behold, but there is still some yet to be sold. So, give us a call if you need to still place an order, you can even stop in and lean on our shoulder! 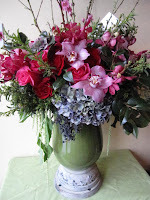 Often times when you imagine a tall and dramatic centerpiece, the base of the arrangement is left behind. It's important that the table looks beautiful when the guests are seated for dinner. Many times, there will be a tall and beautiful arrangement on the table, with a bare table at the bottom. Incorporating a mix of smaller pieces with glowing candles and blooms of flowers on the table at the base of the centerpiece will keep a continuous and flowing centerpiece. You'll be certain your guests will be "ooh-ing" and "ahhing" all night. What should you order for Valentine's Day? 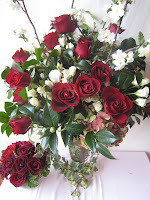 It's time to order your sweetheart Valentine's Day flowers and we are here to help. It might seem a little daunting for you to decide which arrangement is just right? What's the perfect combination of color, what size do you want, how would you like it designed. Is your loved one the English Garden type, a little more traditional or a bit more modern? The Hidden Garden is here to help. The English Garden: Opt for a more compact design of flowers. This type of design will most likely tend to last a little longer. 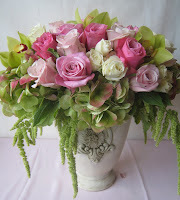 The flowers are designed more tightly together so they tend to hold up a little longer. I have friends tell me all the time "i still have my arrangement!" As i cringe....i know it is dried up on their kitchen table but it's still in tacked! You can go any direction with color choices. One of my favorite combinations is red and hot pink. It's punchy and vibrant. Another great choice is all light pink and white. This is very soft and sweet. The Traditionalist: This is the person that believes the Dozen Rose arrangement is the way to go. This was not always my favorite choice so The Hidden Garden decided to enhance the design with some additional floral elements to help keep the look a little more up to date. 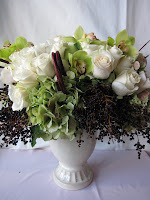 Besides just the traditional dozen roses we have included accents of sweetheart roses, hydrangea and blossom branches. These additions help dress up the arrangement and give it a very grand statement. This arrangement doesn't tend to last as long as the English Garden design (above) but it is gorgeous! The Modern Flair: This year we decided to create a romantic arrangement for those that tend to gravitate towards a modern look. This is another arrangement that will last a little longer than the average. Although the roses might only last 5-7 days (as long as you keep them watered) the rest of the arrangement might last 2 weeks plus! So give us a call, we are here to help! If you are short on time you can even order online! Valentine's Day is just around the corner. The holiday that we (as florists) spend weeks preparing for. We always "hope" that our orders arrive in advance so we can make an accurate sales forecast allowing us some insight on exactly how many flowers to purchase. Unfortunately, this never seems to be the case. I always joke that it's a "man's holiday" which seems to ben equivalent to "procrastination" with flower ordering (hahaha) They still remember to order, it'sjust usually on the day before or on Valentine's Day itself. My marketing instincts kick in and I think, "What if we call the guys with a gentle reminder to order early or send an email blast allowing easy online ordering?" It's worked on a few but we haven't tapped into the majority! At this point, we have surrendered to the fact that we will do our best to "project" the amount of incoming orders and surrender to the fact that this is a holiday that thrives on the last minute orders by our sweethearts. Either way, no matter how the orders arrive to our shop, a week before or the day of, we always appreciate all of the clients who remember to give us a call. We are here to make your look like superstar to your sweetheart! Thank you for the orders whether they arrive the week before or the day of, we truly appreciate it! In partnership with Wildflower Linens & Chameleon Chairs, The Grand Del Mar hosted a beautiful evening with a six course tasting menu. The property was amazing and the chef prepared an unbelievable menu. The guest list consisted of some of the finest wedding planners, floral designers, event producers, and hotel executives from San Diego to Santa Barbara. It was a perfect evening and The Hidden Garden was thrilled to be included. This last week, Trisha had the opportunity to attend the Special Event Show in San Diego. They hold a luncheon to discuss topics regarding special events and weddings. This year's keynote speaker was from The Knot. 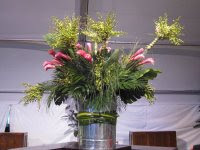 I attached pictures of a few of the centerpieces that were on display from some of the local San Diego florists. 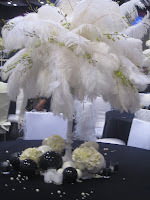 The theme of the luncheon decor was black & white. The convention floor itself had rows and rows of a variety of vendors offering interesting and beautiful companies from the world of weddings and events. We just wrapped up the NFL Super Bowl 2009 Tailgate party!! What an amazing experience (once again). 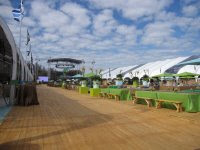 This is the second year in a row that we have been honored to be the florist for the biggest Super Bowl Party around – The NFL VIP Tailgate Party (produced by Party Planners West). 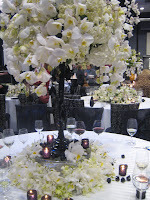 We spent the entire week in Tampa prepping the flowers that adorn the tables and buffets for this event. We had the pleasure of working with a few of the local flower shops in the Tampa Bay area (Sweats Florists & Events by Amore and Jana). They were amazing assistance to us during the design and set up. I don’t think words can describe the magnitude of the party but I’ll try! There were 3 massive tents and an enormous lagoon space that we were responsible for decorating. Within those areas, we created 500 plus centerpieces, 10 oversized buffets, an array of cocktail tables and a variety of miscellaneous areas that just needed a little dressing up. 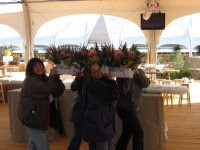 Our flowers were flown in by Mayesh Wholesale from Costa Rica, Hawaii and Miami. A mix of various tropical leaves, ginger, helliconia (hanging and upright), green orchids, white dendrobiums and yellow James Story orchids helped dress the space. Overall, an amazing experience for The Hidden Garden and looking forward to Miami in 2010!